An epic penultimate day of Act 4 of the Extreme Sailing Series™ saw changing fortunes across the fleet as a rampant Oman Air shot to the top of the rankings while early leaders Alinghi dropped off the podium. 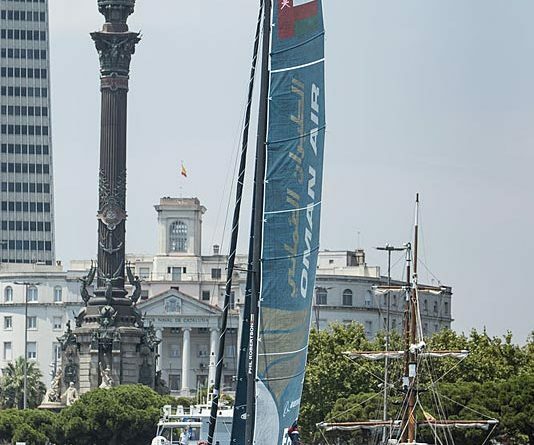 Ten spectacular races held in glorious conditions on Barcelona’s azure waters saw plenty of thrills and spills as the eight international teams fought for vital points ahead of tomorrow’s finale. 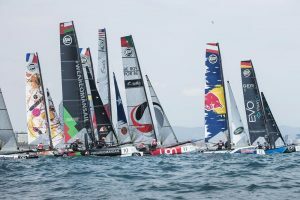 The key to success was nailing the reaching starts set by Race Director John Craig – and Extreme Sailing Series heavy hitters Oman Air, Red Bull Sailing Team and SAP Extreme Sailing Team were happy to oblige. An impressive scorecard boasting three wins, three seconds and three thirds moves Phil Robertson’s Oman Air from third into pole position, while Red Bull Sailing Team end the day in second, just six points behind their Omani rivals, having only finished outside of the podium once. SAP Extreme Sailing Team notched up four victories and two runners-up spots to jump from sixth to third, just ten points behind Oman Air. Robertson, who joined Oman Air at the start of 2017, said: „We kept it pretty simple but our starting was on point and that was the key with reaching starts – if you can get to mark one in good shape then you’re doing well. „We had our trigger pulls locked in and our speed on the reaches was really nice, so that gave us a good position to take the race from there. Adam Minoprio, helmsman of SAP Extreme Sailing Team, was equally happy with his team’s performance, especially after they stole victory from Oman Air in the dying moments of the last race of the day. 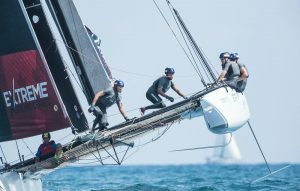 Meanwhile one race win and a third place finish were not enough to prevent Alinghi, the overnight Act leaders, slipping to fourth place – unfamiliar territory for the normally well-polished Swiss outfit. 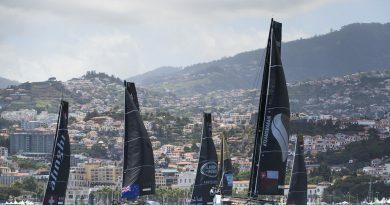 NZ Extreme Sailing Team shot out of the blocks with victory in the day’s opener but then struggled to replicate that form, only reaching the podium on one other occasion to finish the day in fifth. 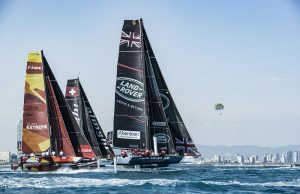 Similarly sixth-placed Land Rover BAR Academy, recent winners of the Red Bull Youth America’s Cup, could only muster one third place finish. Jordi Xammar, the 23-year-old skipper of Spanish wildcard team FNOB Impulse, scored four fourth places in ten races in what is the team’s debut event in a foiling GC32 to move into seventh. It was an achievement not missed by the crowds that lined the stadium racecourse, as they erupted in cheers each time the young crew crossed the line. Xammar and his men repaid the favour with a spot of showboating once racing was over. Spain’s Team Extreme, skippered by 1992 Olympic bronze medallist Mitch Booth, go into the final day of Act 4 in eighth place, 23 points behind their fellow wildcard team. In the Flying Phantom Series French team Cup Legend jumped from third to first with two race wins that leave them tied on points with Austrian rivals Red Bull Sailing Team. Tomorrow’s action kicks off with Flying Phantom racing from 10:00 local time (UTC+2) with the main event, the GC32 Stadium Racing, beginning at 14:00. 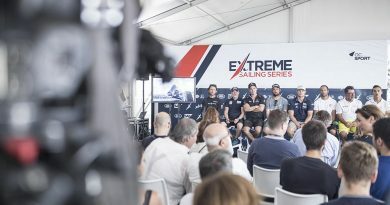 Fans around the globe can tune in to watch the live broadcast of racing on the Extreme Sailing Series‘ Facebook and Youtube channels from 14:00 to 17:00 local time. 1st Oman Air (OMA) Phil Robertson, Pete Greenhalgh, James Wierzbowski, Ed Smyth, Nasser Al Mashari 164 points. 2nd Red Bull Sailing Team (AUT) Roman Hagara, Hans Peter Steinacher, Stewart Dodson, Adam Piggott, Will Tiller 158 points. 3rd SAP Extreme Sailing Team (DEN) Rasmus Køstner, Adam Minoprio, Mads Emil Stephensen, Pierluigi de Felice, Richard Mason 154 points. 4th Alinghi (SUI) Arnaud Psarofaghis, Nicolas Charbonnier, Timothé Lapauw, Nils Frei, Yves Detrey 151 points. 5th NZ Extreme Sailing Team (NZL) Chris Steele, Graeme Sutherland, Harry Hull, Mike Bullot, Josh Salthouse 129 points. 6th Land Rover BAR Academy (GBR) Rob Bunce, Chris Taylor, Oli Greber, Will Alloway, Adam Kay 129 points. 7th FNOB Impulse (ESP) Jordi Xammar, Joan Cardona, Luis Bugallo, Kevin Cabrera, Florian Trittel 113 points. 8th Team Extreme (ESP) Mitch Booth, Alberto Torné, Jordi Sánchez, Jordi Booth, Tom Buggy 90 points. 1st Cup Legend (FRA): Tim Mourniac (FRA) / Pierre-Yves Durand (FRA) 133 points. 2nd Red Bull Sailing Team (AUT): Thomas Zajac (AUT) / Antoine Joubert (FRA) 133 points. 3rd Solidaires en Peloton (FRA): Thibaut Vauchel-Camus (FRA) / Tom Laperche (FRA) 121 points. 4th Lupe Tortilla (USA): John Tomko (USA) / Jonathan Atwood (USA) 106 points. 5th Culture Foil (FRA): Eric Peron (FRA) / Théo Constance (FRA) 106 points. 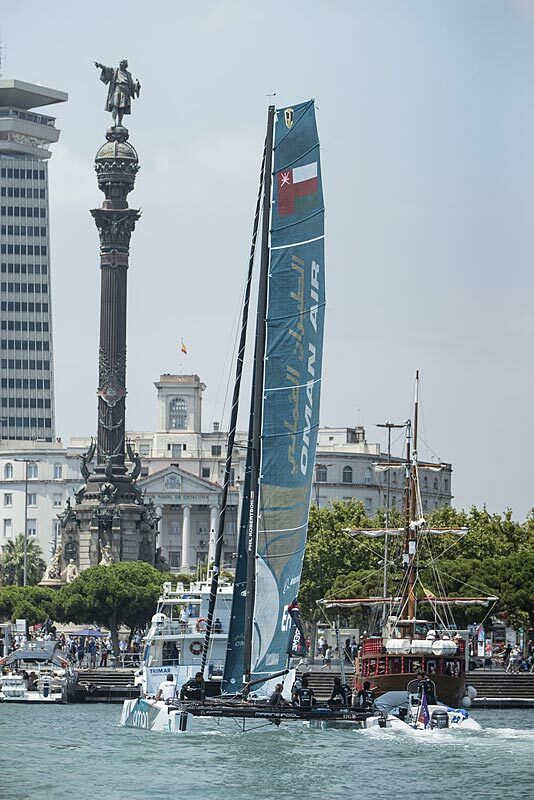 6th Oman Sail (OMA): Thomas Normand (FRA) / Ahmed Al Hasani (OMA) 105 points. 7th EVO Visian ICL (GER): Raphael Neuhann (GER) / Elias Neuhann (GER) 100 points. 8th UON (POR): Jose Caldeira (POR) / Helder Basilio (POR) 100 points. 9th Masterlan (CZE): David Krizek (CZE) / Milan Harmacek (CZE) 95 points. 10th Flying Frogs (FRA): Gwénolé Gahinet (FRA) / Arnaud Vasseur (FRA) 80 points. 11th Back to Basics (FRA): Bruno Marais (FRA) / Max Billaux (FRA) 70 points. 12th Red Bill II (FRA): Dominique Pichon (FRA) / David Mirabel (FRA) 66 points.